Samsung have officially announced the US variants of their popular (and pretty damn sweet) Samsung Galaxy SII phones. It's taken a while, and I have been feeling sorry for my neighbours across the pond not being able to get their hands on what is in my opinion the best phone available at the moment. But now you guys have your chance. The phone will be released for Sprint on September 16 for $199.99, on AT&T on September 18th and T-Mobile sometime this Q3. In a change from normal procedure, only one of the phones will have a custom name, the Sprint device will be called the Galaxy SII Epic Touch (I feel lame just typing that name). Thankfully the others keep the original (and best) naming. The devices differ slightly in curvature, with the AT&T model being the least curved (and my favourite looking), and the T-Mobile being the most curved (my least favourite looking..). The Sprint and T-mobile versions will also have a slightly larger screen at 4.5". Personally I think that's a great sized screen and my 4..3" screen is looking at them quite enviously.! 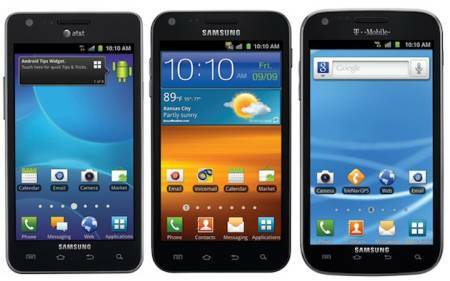 Look for Sprintâ€™s Galaxy S II Epic Touch 4g to launch September 16th for $199.99 on a two-year contract; AT&Tâ€™s Galaxy S II will launch September 18th; and T-Mobileâ€™s will be on the way this fall. NEXT GENERATION OF SAMSUNGâ€™S FLAGSHIP SMARTPHONE PORTFOLIO â€“ GALAXY S II â€“ READY FOR U.S. ARRIVAL Samsungâ€™s fastest selling smartphone in the world coming soon to AT&T, Sprint and T-Mobile DALLAS, August 30, 2011 â€” Samsung Telecommunications America (Samsung Mobile)1, the No. 1 mobile phone provider in the U.S., today announced the Galaxy Sâ„¢ II will be available with AT&T, Sprint and T-Mobile starting this fall. The U.S. launch follows the successful debut of the Galaxy S II in Europe and Korea, where consumers bought 5 million smartphones in 85 days, making the device Samsungâ€™s fastest selling smartphone ever. The next generation Galaxy S II portfolio packs industry-leading hardware and software and the latest version of the Android smartphone platform into each device. The Galaxy S II portfolio is highlighted by Samsungâ€™s own Super AMOLED Plus display technology, a powerful dual core application processor and a robust array of entertainment, messaging, social networking and enterprise experiences. â€œThe unveiling of the Galaxy S II is a landmark achievement for Samsung, our carrier customers and consumers,â€ said Dale Sohn, president of Samsung Mobile. â€œFive million Galaxy S II smartphones have been sold around the world and that number increases every day. We believe the cutting-edge design, features and user experience of this innovative device will share the same level of success in the U.S.â€ The three smartphones within the Samsung Galaxy S II portfolio are designed with an ultra-thin form factor and brilliant Super AMOLED Plus touch screen display. Recent independent studies showed that Samsungâ€™s Super AMOLED Plus display technology was preferred 2 to 1 over any competing display technology in the market today2, thanks to touchscreenâ€™s ability to deliver brilliant colors with the most contrast, providing a vivid and crisp viewing experience. All three Galaxy S II smartphones are enabled with 4G3 service for fast connectivity speeds and dual core processors for seamless web surfing, console-like game play and rapid content downloads. Personalized Customization The Galaxy S II portfolio features an improved Samsung TouchWiz user interface, providing superior multi-tasking, application management, and customization and includes Live Panel which provides a magazine-like widget view for immediate access to weather, social updates, email, news, photo gallery and more, all of which can be customized on the home screen. All of the Samsung Live Panel widgets can be positioned and re-sized to create rich, visual home screens and provide one-touch access to the information consumers use most. Touchwiz UI also includes Quick Panel which allows instant access to commonly used device settings like Wi-Fi, Bluetooth, GPS, and other key device features. The TouchWiz UI notification service on the lock screen notifies users to the number of unread or new text messages, and missed calls that have been sent to you on your Galaxy S II. Users get direct access to missed calls and text messages from the lock screen by swiping the notification boxes without having to navigate through the applications menu. Each of the Galaxy S II devices feature six-axis motion sensing using an accelerometer and gyroscope that support advanced touch screen gestures, including motion to zoom in on images, silence a ringing phone, and even move widgets on the menu screens. Premium Content Galaxy S II will also include Samsungâ€™s popular Media Hub movie and TV content service. Media Hub features thousands of new release and top-grossing titles from major Hollywood studios and leading television networks, including NBC Universal, Paramount, MTV, Warner Bros., CBS and FOX. The content service has added a new feature called Media Hub Show, allowing the user to playback Media Hub content on a TV through an HDMI cable connected to a Galaxy S II dock or HDTV Smart adapter accessory. Users can share purchased to own film or TV content across up to five devices enabled with Media Hub at no additional cost. Alternate premium video options include Android Movies, Netflix, and others which are available to download from Android Marketâ„¢. Samsungâ€™s Social Hub service on the Galaxy S II transfers email, instant messaging, contacts, calendar and social network connections, including Twitter, Facebook and LinkedIn accounts, into â€œFeedsâ€ and â€œMessagesâ€ folders that can be either separated into separate tabs or combined into comprehensive lists. Samsungâ€™s Galaxy S II portfolio is powered by the open and innovative Android Gingerbread platform, complete with full support of Google Mobile Services including Android MarketÃ” with access to more than 250,000 applications, Google SearchÃ”, Google MapsÃ”, GmailÃ”, YouTubeÃ”, Google TalkÃ” and more. In addition, Galaxy S II and the Android Gingerbread platform support an array of cloud services including content sync across the Galaxy branded portfolio with Google services (Books, Music, Videos, Email, Calendar) Samsung Media Hub and cloud photo sync through Picasa Web Albums and Google+. Uncompromised Convergence The Galaxy S II portfolio offers a number of convergence features to share content in tethered and wireless formats. With Samsungâ€™s All Share application, which enables inter-device connectivity through DLNA (Digital Living Network Alliance) technology, users can send user-generated video content wirelessly to other DLNA-enabled devices, such as TVâ€™s, monitors and laptops, allowing for an interactive entertainment experience. The TV Remote App, also available through Android Market, transforms the Galaxy S II into a remote control for several top models of Samsung HDTVs. Smart Show and Media Hub Show enables the user to tether an HDMI over micro USB connection to an HDTV to play user generated or Media Hub DRM protected content respectively directly from the Galaxy S II device to the HDTV screen. Samsung Kies Air service allows users to connect their PC or Mac via WiFi without a preloaded application to easily view and manage your content. Users can transfer files, manage contacts and messages and send SMS from the PC. Optimal Enterprise Solutions Galaxy S II integrates a range of enterprise solutions that expand the business capabilities of the devices. The Galaxy S II portfolio provides support for exchange device management policies, offers increased security of data and services and enables mobile conferencing while on the go. Galaxy S II also features productivity enhancement capabilities such as the ability to create and respond to meeting requests, view, edit, and create MicrosoftÂ®-compatible documents, spreadsheets, and presentations, global address lookup (GAL), and more. Additional enterprise solutions include: On-device encryption of user data Full support for Exchange ActiveSyncÂ® version 14 Cisco VPN (Virtual Private Network) Sybase MDM (Mobile Device Management) Cisco WebEx mobile conference solution Additional features of the Galaxy S portfolio include: Â· 8-megapixel Rear-Facing Camera with Autofocus & Flash & 1080p HD Video Recording/2-megapixel Front-Facing Camera: The Galaxy S II portfolio features an 8 megapixel camera with flash and can record video in 1080p HD high profile offering the richest video content on a smartphone. Plus, the front-facing 2 megapixel camera provides video chat capabilities for personal and business communication on-the-go. Galaxy S II supports popular video conferencing services like Skype, Fring, Qik and Tango. Â· Voice Talk: The Galaxy S II Voice Talk feature allows users to give their Galaxy S II device voice commands, including voice dial, text message, navigation, music, Web browsing and search. When docked into the car dock, the Galaxy S II automatically defaults into Voice Talk mode. Users can instantly activate the Voice Talk application by a long press on the search key. Â· Task Manager: View and close the applications users have active, what items have been downloaded and check on memory usage via the Task Manager widget. Â· Screen Capture Feature: Users can easily take a screen grab of the phone screen by pressing the power button and the home key simultaneously. Â· Memory: All three Galaxy S II devices offer 16GB of on-board memory, as well as a microSD card slot that supports up to a 32GB memory card. Premium Accessories Portfolio A host of premium Galaxy S II accessories, including convenient solutions for docking, convergence, and backup battery charging will be available for each smartphone, providing users with an enhanced mobile experience. A multimedia dock is the perfect smart accessory, allowing users to transform their Galaxy S II into a home stereo by connecting speakers or plugging it into a home entertainment system via the 3.5mm stereo connector. Its ability to orient with the phone while docked makes it easy to view content in portrait and landscape mode, while the auto-launch of its Desk Dock UI makes for easy access to music, video and other applications. Additional accessory solutions include: Vehicle dock: The dock charges the phone while docked to ensure uninterrupted GPS usage on long car rides. The dock is windshield or dashboard mountable and includes the sophisticated Vlingo Voice Talk, allowing users to enjoy hands-free control of their Galaxy S II. Battery charging stand with spare battery: This charging solution ensures a backup battery is always on hand, while providing a convenient kick stand for the Galaxy S II. HDTV Adapter: The HDMI adapter supports HD video up to 1080p from the phone to an HDTV, projector, or monitor. Use on the go to connect the Galaxy S II to a TV, monitor, or projector to view purchased Media Hub content, videos, presentations, games, or internet on a big HD screen, or listen to downloaded music from the phone on a home entertainment system. 1 Number one mobile phone provider in the U.S claim for Samsung Mobile based upon reported shipment data, according to Strategy Analytics, Q2 2011 U.S. Market Share Handset Shipments Reports. 2 Super AMOLED Plus consumer preference claim based upon Q2 2011 independent study conducted by Strategy Analytics. 3This refers to the fact that such products are capable of operating on the applicable carrierâ€™s 4G network, to the extent available. About Samsung Telecommunications America Samsung Telecommunications America, LLC, a Dallas-based subsidiary of Samsung Electronics Co., Ltd., researches, develops and markets wireless handsets, wireless infrastructure and other telecommunications products throughout North America. For more information, please visit www.samsung.com. About Samsung Electronics Co., Ltd. Samsung Electronics Co., Ltd. is a global leader in semiconductor, telecommunication, digital media and digital convergence technologies with 2010 consolidated sales of US$135.8 billion. Employing approximately 190,500 people in 206 offices across 68 countries, the company consists of nine independently operated business units: Visual Display, Mobile Communications, Telecommunication Systems, Digital Appliances, IT Solutions, Digital Imaging, Memory, System LSI and LCD. Recognized as one of the fastest growing global brands, Samsung Electronics is a leading producer of digital TVs, semiconductor chips, mobile phones and TFT-LCDs. For more information, please visit www.samsung.com.